A standard definition of medium-term trading in Forex would limit the holding period — from entry to exit — of one day to five days. In Forex, a trader who enters and exits on the same day can be considered a medium-term trader when the intent is to hit a specific stop/target rather than to limit the trade to a time constraint like one to four hours. It may seem silly to call a holding period of one day “medium-term,” and in other asset classes such as equities, that would be true. Medium-term in equities would be on the order of several weeks or months. But because so many Forex traders focus on trades lasting only a few hours, we look at “medium-term” in Forex in a different context. As with short-term trading but on a different scale, medium-term trading limits the amount of risk you are taking, since when you are out of the market, you are taking zero risk. And also similar to short-term trading, medium-term trading allows you the luxury of walking away from your screen. You are not chained to your desk, and do not need to take any trade unless the chart presents you with conditions you consider tradable. While true short-term trading emphasizes bar and candlestick patterns that reflect immediate sentiment, medium-term trading employs any and all of the techniques in the technical analysis toolkit, including support and resistance, the math-based indicators (RSI, MACD, stochastics, etc. ), and patterns as well. Many indicators require more than a few hours to develop, including support and resistance and some patterns, like head-and-shoulders. You can draw a support line on a 5-minute chart, but it will be less useful and reliable than a support line on an hourly or daily chart. If you see a head-and-shoulders on a 5-minute chart, it could be authentic or it could be an accident of randomness. One useful characteristic of medium term-trading is that the mindset associated with the longer timeframe allows multiple entries and exits on the same move. This is where consulting charts of multiple timeframes comes in handy, as do well-constructed stop and take-profit rules. For example, see the figure below, the GBP/USD pair on a weekly timeframe. We have a double bottom that suggests a lasting uptrend, and that diagnosis is confirmed when the price exceeds the center high of the W-shaped formation. The price has been rising for several weeks and is a well-established uptrend. 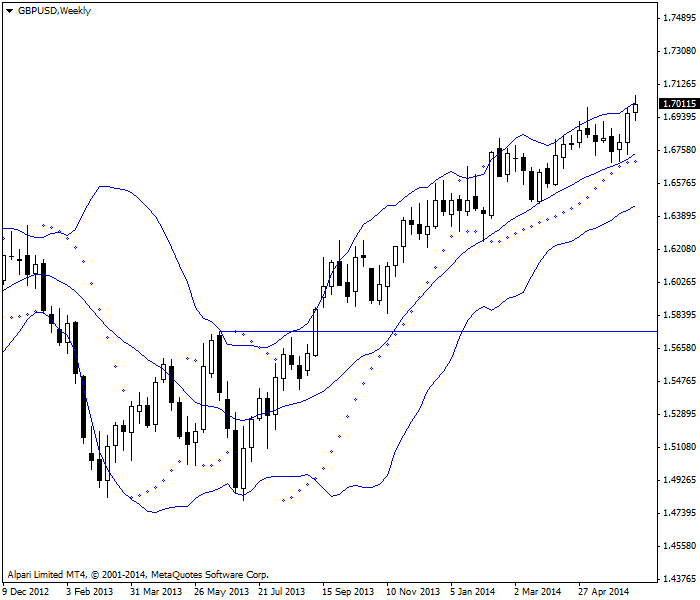 Double bottom generates a strong uptrend on GBP/USD weekly chart. We know that prices never move in a straight line and we seek to “fade the trend” when a pullback begins. Now, see the daily chart of the same currency pair below. This chart shows the penultimate daily bar is an inside day (high and low within the limits of the high and low the day before), suggesting uncertainty and possibly less bullishness. The important point is that a new higher high is clearly not occurring and it is noon in New York on a Friday. All the news for the day is out and a higher high cannot be expected now. Meanwhile, the stochastic oscillator in the bottom window shows the GBP to be seriously overbought, a confirmation that a pullback is forming. We go short at 1.7040. 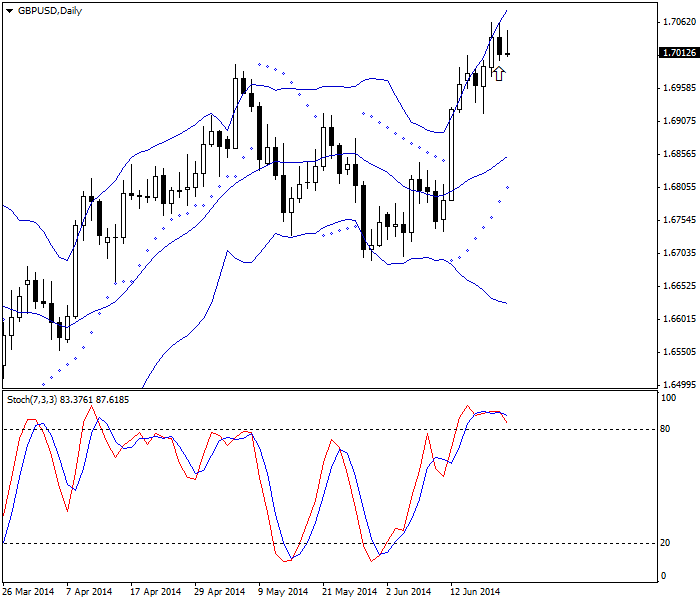 Inside day combined with stochastic indicator suggest a good selling opportunity on GBP/USD daily chart. Now, consider the 4-hour chart below. We are searching for the place the temporary downmove will end, and there are several possibilities. We have a plain vanilla diagonal support line. We have the 20-period center line of the Bollinger Band. We have a parabolic reversal dot. Finally, we have the horizontal midpoint of the big upside breakout bar. We expect a pullback not to exceed the previous lowest low and thus horizontal line does that, as well as exceeding the bottom of the Bollinger band. If either or both get broken, the pullback could mean a much bigger deal than we are imagining right now. 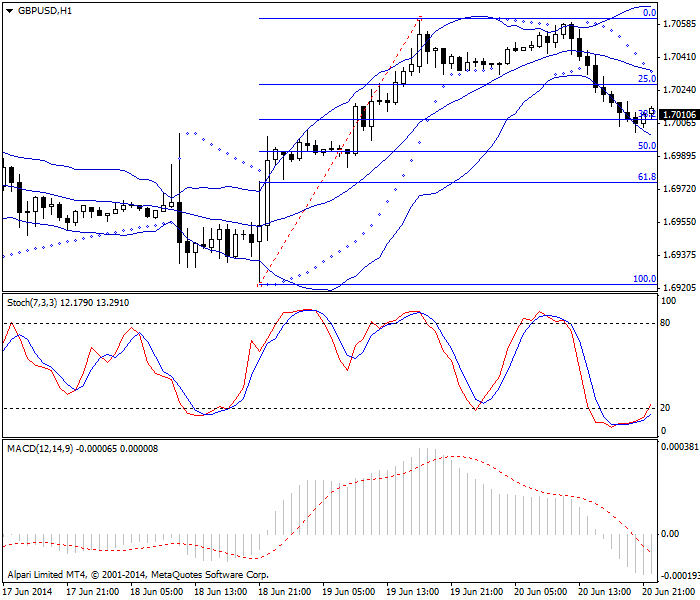 Indicators and support levels are delimiting pullback extent on this GBP/USD 4-hour chart. Finally, look at the hourly chart below. This one shows that we already have a parabolic reversal in this timeframe, and the correction has already reached the 38% Fibonacci level. The Stochastic in the lower window shows the pound oversold, but MACD below it has some room to fall. We can take profit at the current level for a 32-point gain, or hope for a further dip to the 50% level and get additional 18 points. 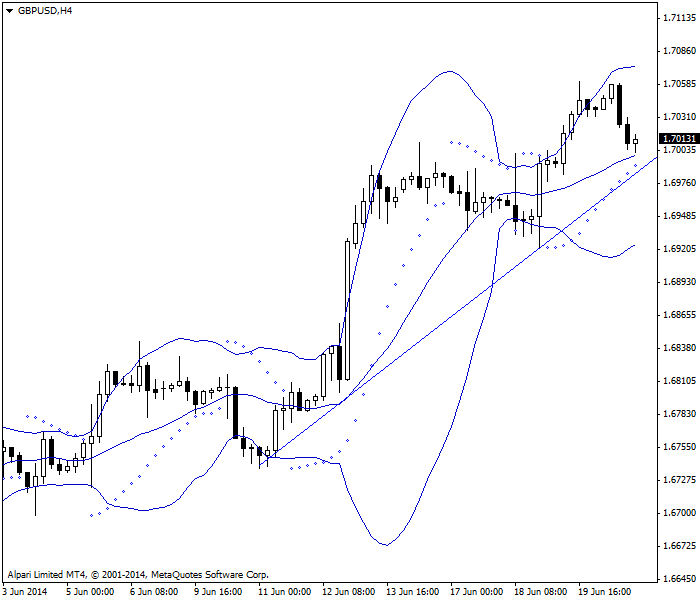 Stochastic suggests an exit from a short trade on GBP/USD hourly chart. This is a classic day-trade and would be considered a “medium-term” trade even though the whole thing from entry to exit is occurring on the same calendar date. One of the things that makes it medium-term is that we have a logical next trade — going long again on the assumption that the weeks-long uptrend will resume. We could do an outright reversal (buy back the short and place a new buy) right here, or exit here and place an order to buy at 25% retracement level (a “prove-it” entry) and/or the 61.8% retracement level, whichever comes first, for the next trading session — which will be on a Sunday in the Asia session. On the other hand, maybe we think the correction could become far bigger, and we choose not to place any trade at all until we see the next opening prices. The long trade following the fade trade make a matched pair of trades that exploits the natural ebb and flow of price movements. In this case, the hour of the day and the day of the week were relevant to the trading decision. We may also consult news events that have already occurred to consider whether they are determinative, plus news that is pending, like economic data, and not only in the target currency, the GBP. We would also want to see what is going on in the dollar overall to see if there is a spillover effect to sterling. 2. Medium-term trades use what indicators? 3. Medium-term traders consult what timeframe charts?